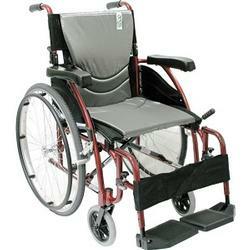 Lightweight wheelchairs are extremely popular for two reasons. First, they weigh less (28 to 35 lbs) than standard wheelchairs. This means the user has less weight to push around. 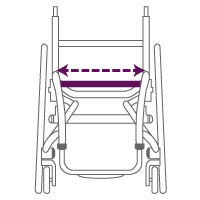 Second, when loading in vehicles for transport, lighter weight chairs require less effort to lift and carry. Lightweight wheelchairs can also be ordered with more customized options than standard chairs, so you have more options to choose from to meet all your needs and preferences. Are you looking for a wheelchair that is a few pounds lighter than a standard weight basic manual wheelchair? At only 24-38 pounds a lightweight wheelchair is a great choice that is still sensitive to price. We have divided lightweights into two categories that will allow you to make a choice based on your needs. 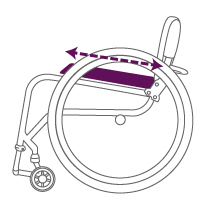 Wheelchairs in this category have the benefit of being lighter than a standard wheelchair but still in an easy-to-order format. Ordering from this category only requires a few decisions and your new wheelchair will be on its way to you in 1-2 business days. 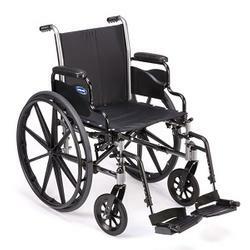 Custom Lightweight Wheelchairs - As the name implies...these are custom. Wheelchairs in this category offer a wider selection of measurements, colors and options. These wheelchairs are for a user who has both a need for lighter wheelchair and also a wheelchair that has more custom options such as a non-standard seat-to-floor height or back height. These wheelchairs meet very specific needs and are custom built by the manufacturer. They take a little longer to get out the door and are subject to a 15% re-stocking fee if returned. 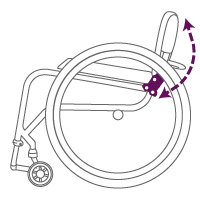 How do I buy a manual wheelchair from Spinlife? Just configure your lightweight wheelchair online after clicking the "Customize" button, or call our experienced SpinLife product experts at 1-800-850-0335 to help you build the perfect wheelchair today! Medicare only rents manual wheelchairs for Medicare beneficiaries, with the exception of ultra lightweight wheelchairs, which they will purchase. Because SpinLife only sells standard and lightweight wheelchairs, we can not bill Medicare for those types of manual wheelchairs. SpinLife is here to support you through the complete sale and this includes helping you with any problems that may come up after you receive your manual wheelchair. SpinLife honors all manufacturer warranties on the products we sell. Please call SpinLife customer service at 800-850-0335 and tell us what you need. If the part is covered by warranty we will send it to you at no charge. The manufacturer may require that you return the original part to them for inspection but we will tell you this information at the time we order your replacement warranty part. Of course, SpinLife sells a full line of manufacturer and aftermarket parts for all manual wheelchairs that we offer. What happens if I want to return my lightweight manual wheelchair? We here at SpinLife want you to be completely satisfied with your wheelchair purchase. If your custom or quick-ship lightweight manual wheelchair arrives and it is not what you expected or needed, you can return it within 30 days as long as it is unused (tires are clean and no scratches) and in its original packaging. You are responsible for shipping charges to return the wheelchair. There is a 15% restock fee on custom lightweight wheelchairs (there is no restock fee on quick-ship lightweight wheelchairs). If the wheelchair arrives damaged or is not what you ordered, SpinLife will arrange for freight and for shipping you an undamaged or corrected unit.